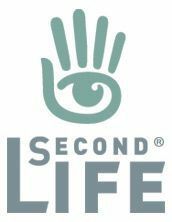 In something of an unusual promotion, Linden Lab is offering Second Life creators with a 50% discount on a training course for learning how to use a tool suite called Marvelous Designer – and to be honest, I’m scratching my head a little over it. Allows you to create beautiful 3D virtual clothing … with tools that enhance quality while saving you time. From basic shirts to intricately pleated dresses and rugged uniforms, Marvellous Designer can virtually replicate fabric textures and physical properties to the last button, fold, and accessory. The product boasts use in a wide range of environments include 3D and the world of film, where the results can apparently be seen effects created by Weta Workshop for The Hobbit and The Adventures of Tin-Tin. Visit the CG Elves site through this link, opt in to the “Mastering Marvelous Designer: Beginners Course & Advanced Workshops,” select any add-ons you may want, then use secondlife-special in the coupon code section of the checkout cart to receive your discount. This offer is only good until December 30th, 2015 – so find out more about the training course and if it’s right for you by visiting the CG ELves website today! I don’t pretend to be a clothing content creator, so I know little about what tools are in use by SL content creators, how useful this offer might be or how widely Marvellous Designer may be used by SL content creators. However, given that Marvelous Designer has a pricing structure which starts at a monthly subscription of Us $59.00 and runs through an annual subscription of US $360.00 or a one-off payment of US $550.00 (with no option to switch between perpetual and subscription options), part of me suspect the tool might be seeing widespread use by SL designers. However, there is a 15-day free trial for those wishing to give it a poke. The training course itself totals some 52.5 hours of video training, delivered in 1080p quality. It comes at a full cost of US $399.00 – so the discount offer will reduce this to US $199.50 – something which again may not have even the curious knocking down the door. However, to find out more, follow the links to the CG Elves website, above and below. As noted, this is something of a curious offer for the Lab to roll out, and I’m not overly convinced at to how well it might be received or taken up. Is this also some vague pointer that Marvellous Designer is a tool set that will be supported by “Project Sansar”? Your guess is as good as mine. In the meantime here are the links again. Furillen, Serene Footman’s homestead region has been on my radar for a while, having been labelled as “under construction” the first time I dropped in during November. This past weekend offered an opportunity to make a revisit to see how things are progressing, so Caitlyn and I headed over to look around. The region is named for – and modelled after – a small island off the north-east coast of Sweden’s largest island, Gotland. During the 20th century, Furillen was a centre for limestone quarrying, but in 1970 it was taken over by the Swedish military to become the location for two air defence radar installations, the quarries being abandoned as a result. With the military presence now largely gone from the island, it has, since 2000, it has been the location for a minimalist hotel and conference centre owned by photographer and entrepreneur Jonas Hellström. Serene Footman takes these elements from the original Furillen and brings them in-world to present, in keeping with Hellström’s approach to his hotel, a minimalist design shrouded in the bleak skies and heavy snows of midwinter, which is quite starling and captivating in its desolate beauty. Explore the islands and you find not only the squat, angular lines of the hotel, but also other landmarks from the original, including the remnants of the old limestone quarries, complete with rusting heavy equipment, traces of the former military presence, and some other quite unexpected sights. There is also a touch of the surreal to the design as well, something I particularly felt on seeing the door marked “Exit” in the south-east corner of the region, separated from the island by a stretch of cold water, and apparently beyond reach. This, with the presence of the Peatonville Asylum’s Queen of Denial put me in mind of the final lines of The Eagles’ Hotel California. Whether this is intended or not, I’ve no idea; although to me the echo of the lines didn’t seem to be entirely out-of-place. Which is not to say Furillen is in any way sinister; far from it. As I’ve already noted, there is something remarkable in its desolate look. It is hard not to be drawn in to the rugged beauty of the landscape and the functional, stark lines of the buildings here. It’s an attraction that is very hard to leave behind, as I’ve discovered for myself, having bounced back a number of times throughout the weekend and since. Serene Footman plans to keep Furillen going for as long as there is an interest in visiting the region, and has indicated he’ll be adding to it and changing things as the mood takes. So, if you do visit and find yourself as captivated as I, do please consider leaving a donation at one of the tip jars to help towards running costs. And to fully experience the region, do take time to listen to the accompanying music stream, which adds further depth to the region as one explores. It is not often that I get to report on a space event that is happening right as I’m wiring about it; but that is precisely what happened as I wrote this edition of Space Sunday. As I was typing, high above Venus, a little cube-like space craft measuring just over a metre on a side and supported by two stubby solar panel “wings”, had been making a final desperate attempt to enter orbit around the planet. Akatsuki (“Dawn”), is a Japanese space probe also known by the names Venus Climate Orbiter (VCO) and Planet-C. Its mission is to study the dense, intense atmosphere of Venus and gain greater insight into how it formed, whether it has active weather phenomena such as lightning, and whether Venus itself may still be volcanically active. It is also a vehicle which has taken “the long way around” in order to reach its target. Originally launched on May 20th, 2010 Akatsuki should have entered orbit around Venus on December 7th of that year. In order to do so, the vehicle had to carry out a 12-minute “burn” of its main engine to slow itself to the point where it would be caught by Venus’ gravity and so swing into an elliptical orbit. However, while the engine did fire as expected, a fuel valve failed, preventing the burn from being completed as required, and Akatsuki failed to achieve the desired orbit, and instead was left strained in a heliocentric (Sun-centred orbit) which would bring the craft back into proximity with Venus five years later – on the evening (UK time) of the 6th / 7th December 2015. Having managed to keep the little craft alive and functioning during the intervening years, this second encounter offer a final opportunity to get Akatsuki safely into orbit around Venus, where it might complete its primary mission. Final because the craft has already far exceeded its operational life span, and such an opportunity is unlikely to come again. 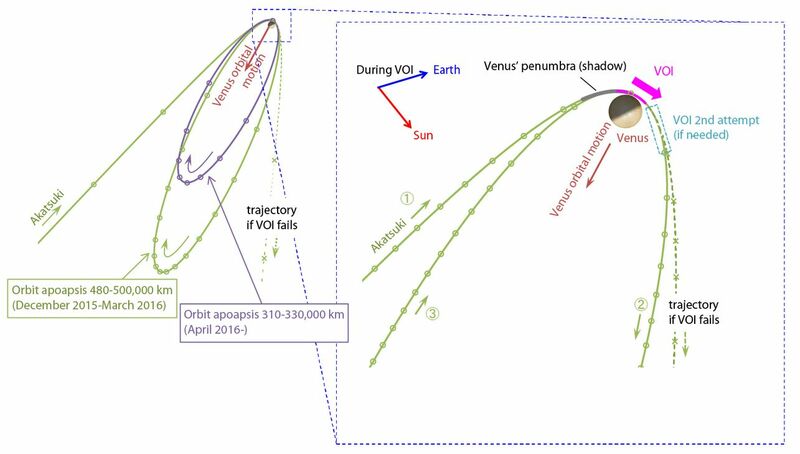 So it was that at around 23:51 UTC on Sunday, December 6th, Akatsuki fired one set of its reaction control system (RCS) thrusters for 20 minutes in an attempt to push itself into an extended orbit around Venus (VOI – for Venus Orbital Insertion – in the diagram above). Entirely automated, the attempt could, if required, be followed by an additional motor firing if telemetry received on Earth indicated the first burn had failed. 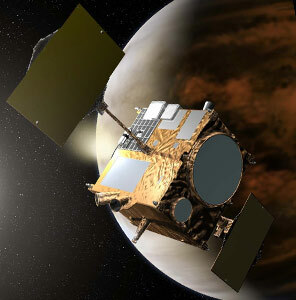 At 00:24 UTC on December 7th, data received from the vehicle, having taken over 8 minutes to be transmitted to Earth and then be processed, indicated the initial motor firing had been successful, and that Akatsuki should have established itself in an extended elliptical orbit around Venus, between 300,000 to 400,000 km above the surface of the planet. This is somewhat greater than the original orbit for the craft, which would have varied between 300 to 80,000 km, but it still should be close enough for the probe to undertake most of its science mission, although it will be several hours before this is confirmed. 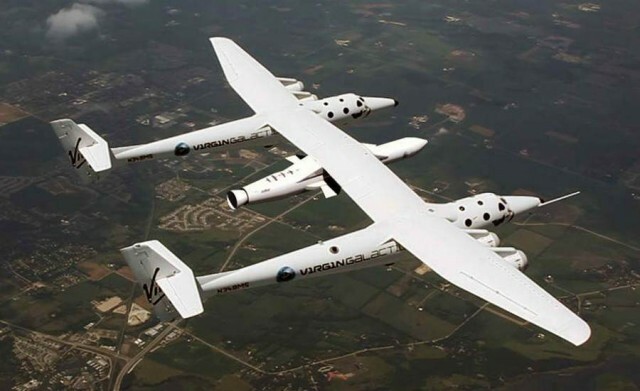 Virgin Galactic is probably best known for two things: Richard Branson and trying to develop a sub-orbital flight capability which will allow fare-paying tourists enjoy a few minutes of “weightlessness” at the edge of space, marketing itself as the “world’s first commercial space line”. However, the company is also looking to enter the lucrative market of commercial satellite launches, using a vehicle they’ve christened LauncherOne. The vehicle is specifically intended to to provide a launch capability for “smallsats”, sub-500 kg satellites, an increasingly poplar market sector, but one where very often the main means of getting into orbit is by “hitch-hiking” aboard launchers carrying other payloads. Unlike most boosters, LauncherOne is designed to be air-launched. That is, carried aloft by an aircraft to an altitude of some 10,770 metres (35,000 ft) before being released to allow its first and second stage motors carry its payload up to the required orbit. The technique isn’t new – it is used most notably by the Pegasus launch system developed by Orbital ATK, and which first flew in 1990. However, the technique offers some significant advantages. The most obvious of these is that by lifting the booster a fair way out of the denser part of the Earth’s atmosphere, less fuel is required for the rocket to reach orbit, reducing its overall mass and cost. Air-launched missions also aren’t restricted to a launchpad; they can be undertaken from any airport where there are suitable facilities for handling the booster itself, thus maximising the potential launch profiles a customer might need. When all the benefits are put together, it means that Virgin Atlantic can offer tailor-made smallsat launch capabilities to clients for just US $10 million a shot.